A modular design philosophy will allow Ford to better address customers' preferences, while simplifying the product design process and unlocking huge material cost savings. Since taking the helm of struggling auto giant Ford Motor (NYSE:F) last year, CEO Jim Hackett has emphasized a need to improve Ford's "fitness" -- by which he means reducing its cost structure. Last fall, the company announced plans to reduce spending by $14 billion over the 2018-2022 period. In April, Ford increased this cost-cutting target to $25.5 billion. 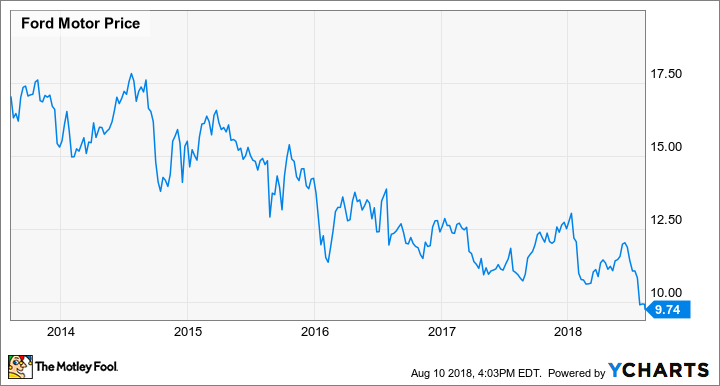 Considering Ford stock's dreadful performance -- it has plunged more than 40% during the past five years, reaching a new multiyear low last week -- it's clear that investors are skeptical of Hackett's cost-cutting goal. However, in a recent presentation, Ford provided more details to explain how the company will radically transform its business in the next few years. Ford Motor Company Stock Performance, data by YCharts. About a decade ago, former Ford CEO Alan Mulally began implementing a strategy he called "One Ford." The idea was to boost earnings by radically simplifying Ford's product lineup. Rather than building nearly 100 different models customized for various markets around the world, the One Ford strategy involved focusing on 20-30 global models. This strategy raised complications in terms of getting regulatory certifications in every market where Ford operates. However, it allowed the automaker to devote more engineering and marketing resources to each vehicle, driving a huge turnaround in the years following the Great Recession. Additionally, under the One Ford plan, many models share platforms. For example, a compact car and a compact crossover could have similar underpinnings but different body shapes. Ford currently uses nine different platforms. However, in the past couple of years, the One Ford strategy has started to show cracks. First, there is little commonality between vehicles riding on different platforms, leading to duplication of effort -- some of which is unnecessary. Second, the rigid focus on simplifying the model lineup has made it hard for the Blue Oval to match customers' tastes in certain markets -- most notably in China, where Ford's sales have been plunging recently. The One Ford strategy needs some major updates. Image source: Ford Motor Company. The solution that Ford has chosen is to simplify even further, to just five vehicle architectures. These will include a dedicated architecture for electric vehicles, one for body-on-frame models (i.e., trucks and large SUVs), one for commercial vans, and two architectures for cars, crossovers, and unibody SUVs: one for front-wheel-drive models and one for rear-wheel-drive models. This is similar to a plan General Motors (NYSE:GM) has been working on for several years, which is designed to shift each of GM's models onto one of four flexible "vehicle sets" by 2025. Furthermore, Ford is developing "modules" -- sets of common components -- that can be used in multiple models. Some modules, like suspension designs, would be used by multiple models sharing the same architecture. Other modules, like center displays, could be used by even more models spanning different architectures. Modules that can be reused across architectures will eventually cover 40% of vehicle value for Ford, with architecture-specific modules covering another 30%. That will leave only 30% of each model's value based on parts that have to be developed specifically for that model. Cost savings won't be the only benefit of this plan, either. The modules-plus-architectures design concept will allow Ford to customize its products more to match local and regional tastes. This should lead to higher average transaction prices. It's going to take a lot of work for Ford to move all of its vehicles to shared modules riding on five basic architectures. However, if the company can pull it off, the potential earnings boost is enormous. Despite this earnings upside, Ford stock currently trades for just seven times the company's reduced 2018 earnings forecast. That makes it look like a compelling turnaround bet today.